GEO ExPro - Lebanon. The New Levantine Exploration Opportunity. Lebanon. The New Levantine Exploration Opportunity. 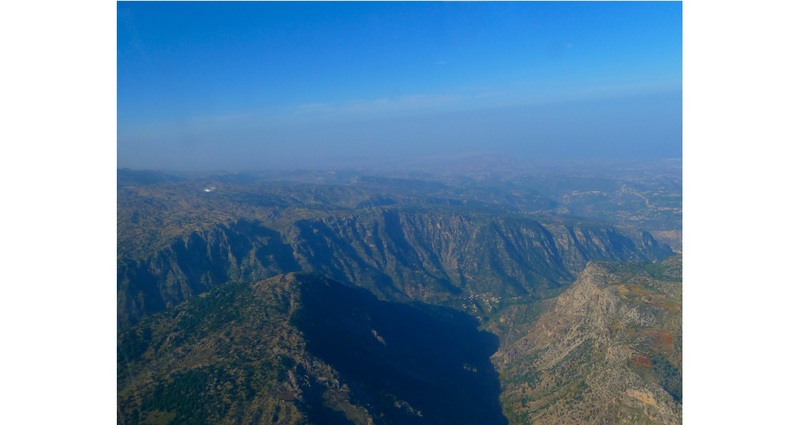 Lebanon lies at the centre of known regional hydrocarbon systems, but it is poorly explored and understood, possibly due to topographic challenges to terrestrial geophysical acquisition. 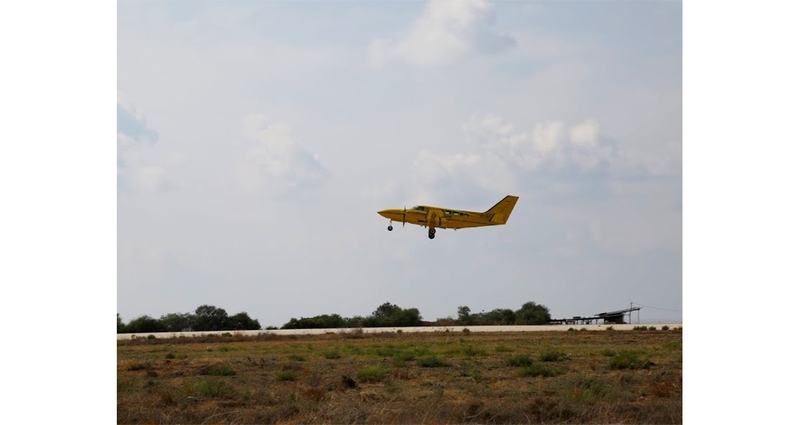 A recently acquired suite of airborne geophysical measurements complemented by sub-surface regional resistivity data aims to remedy this situation. The Eastern Mediterranean region has recently become noticeable for its oil and gas exploration success, particularly in the Nile Delta Cone and southern Levantine Basin, offshore Cyprus and Israel. However, some countries in this region have been producing hydrocarbons for a very long time. Just a few years ago, for example, Syria was producing 400,000 bopd, and at 2.5 Bbo it possessed the largest hydrocarbon reserves of any producer in the greater Levant region, excepting Iraq. Lebanon resides squarely in the centre of these known regional hydrocarbon systems, but their existence and association have yet to be assessed. Figure 1: Map showing the location of the study area outlined in red, with oil and gas fields around the country of Lebanon. Lebanon extends along the eastern coast of the Mediterranean Sea and lies within the same Mesozoic basinal area in which major oil and gas fields have been found in the offshore and onshore Levant Basin and the northern part of the Arabian shield (Figure 1). Hydrocarbon exploration in Lebanon started in 1930; since then, only seven wells have been drilled, all of them onshore and none having reached rocks older than the exposed (Jurassic) strata nor encountering oil or gas in commercial quantities. Most Mesozoic rocks in Lebanon were deposited in the intraplate Palmyride Basin, which extends from north-east Egypt northwards through Israel, Lebanon and Syria to north-west Iraq (Figure 1). Subsidence of the Palmyride Basin began in the Late Permian and was probably associated with the opening of Neo-Tethys. It has been suggested that the Palmyride trough continued to be a depocentre in Syria until the Late Cretaceous. Due to the recent oil and gas discoveries, the Eastern Mediterranean region has become a desired place for further exploration. As a consequence, new interest began to build in Lebanon’s hydrocarbon potential, in particular around the country’s offshore prospects just north-east of the major gas discoveries at Leviathan and Aphrodite. Multiple sets of 2D and 3D seismic data were acquired over the entire offshore region of Lebanon. 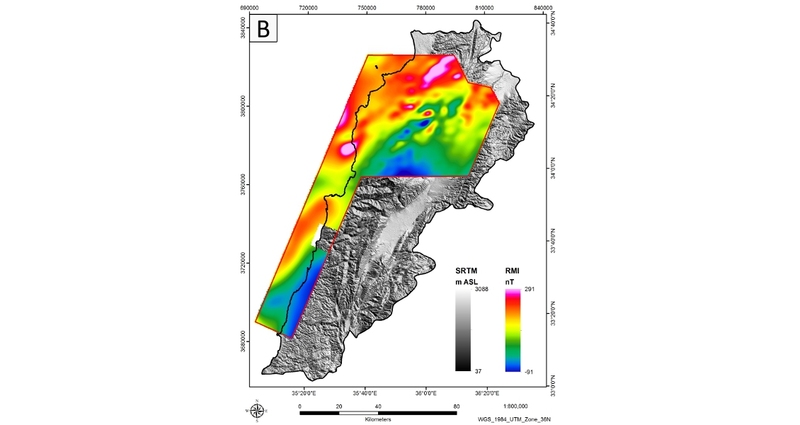 Having enriched the country’s offshore geophysical database, the Lebanon Petroleum Administration (LPA) turned its attention to gathering geophysical measurements and re-assessing the hydrocarbon potential of the country’s onshore basins. Initially, the plan was to acquire several hundred line-km of 2D seismic, but those plans were scaled back and ultimately never implemented because of the challenges to terrestrial geophysical acquisition posed by Lebanon’s topography. Consequently, NEOS and its local Lebanese partner, Petroserv, proposed a plan that involved acquiring a suite of airborne geophysical measurements – including gravity, magnetic, radiometric and hyperspectral – complemented by sub-surface regional resistivity data acquired using ground-based magnetotelluric (MT) receivers. The two-month acquisition operation over a 6,000 km2 area of investigation in the northern onshore portion of the country and its near-shore coastal waters concluded in 2015. Once processed, the acquired measurements were integrated and simultaneously interpreted with other legacy G&G datasets, including the limited well data, along with some of the offshore seismic data. Whether there was evidence of an active and extensive hydrocarbon generating system underneath the project area. Whether and how Lebanon’s onshore and near-shore hydrocarbon system(s) related to others in the area, in particular, the mega-discoveries in the Eastern Mediterranean. Whether evidence for potential commercially viable reservoirs existed, especially in the Triassic interval, and given the modelled burial depths, thickness, trapping mechanisms and areal extent. Figure 2: Airborne hyperspectral imaging revealed direct and indirect hydrocarbon indicators, including oil seeps, over a large portion of the survey area. 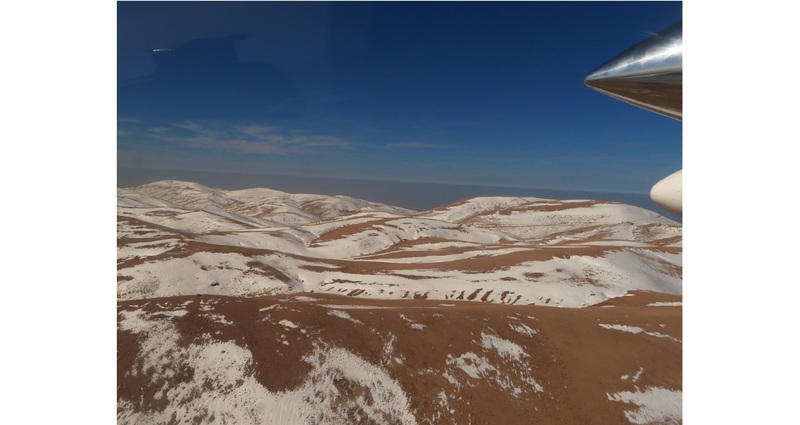 During October 2014, NEOS acquired hyperspectral data over the northernmost portions of the Lebanon Project area (Figure 2). These data were collected in order to better understand and characterise the geology, petroleum systems, and hydrocarbon prospectivity of the northern study area. 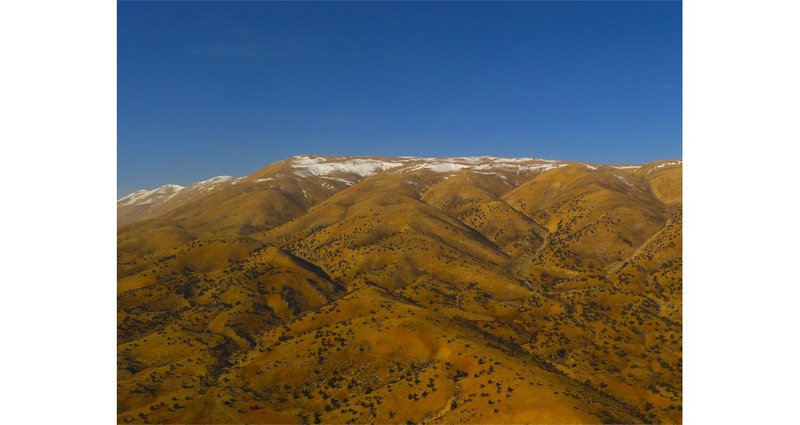 Due to the physics of acquisition, as well as security prohibitions and flight restrictions in the area, the small southern onshore portion of the Lebanon Project was not covered by the hyperspectral acquisition outline. The hyperspectral measurements, which are used to search for indirect and direct hydrocarbon indicators on the surface, identified mineral alteration zones often associated with hydrocarbon micro-seepage in large parts of the survey area. These data also indicated a large expanse of oil seeps throughout much of the area of investigation. The sheer number of these seeps and their locations along newly mapped fault networks and along the boundaries of key stratigraphic intervals suggest an active (and potentially liquids-prone) hydrocarbon-generating system beneath Lebanon. 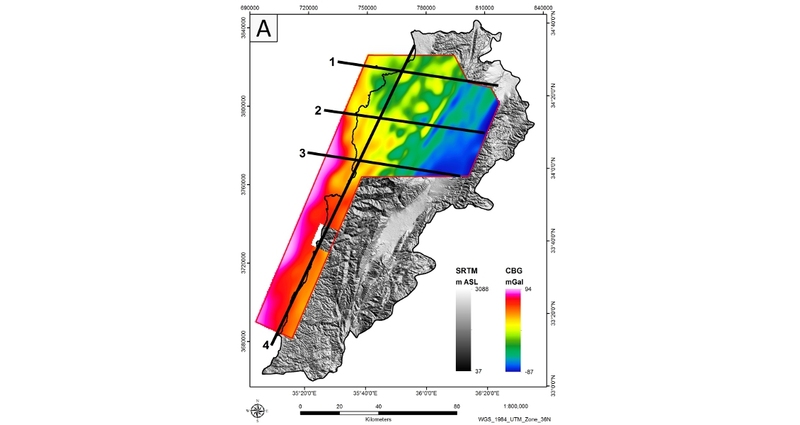 During November and December 2014, NEOS acquired over 6,900 line kilometres of airborne gravity and magnetic data in northern Lebanon (Figure 3). Figure 3: A) Bouguer gravity data with solid black lines showing the locations of 2D modelling profiles (see Figure 4 below). B) Reduced Magnetic Intensity (RMI) data. A sedimentary basin architecture study was conducted to identify major contacts between the sediments and the basement. Depth parameters were computed using the spectral signature of the gravity and magnetic data, 2D forward modelling and inversion methods. Four 2D profiles were created in the study area to gain better knowledge of the structure and relationship between the sedimentary basin and the Precambrian basement (Figure 4). Based on known geology and results from the 2D modelling, this area is characterised by irregular basement topography with Palaeozoic to recent sedimentary cover. The strata is faulted and folded by Tertiary to present tectonic activity that occurs in the region. The geometry and thickness of the sedimentary basin are constrained by well data and were modelled to fit the gravity and magnetic data. Figure 4: A) Line 1. B) Line 3. The black lines in the top two panels represent the measured magnetic and gravity data, respectively, with values calculated from the models; the red line represents the error between the two. See Figure 3A for profile location. The top of basement surface is predominantly irregular, and becomes deeper towards the offshore transition zone. 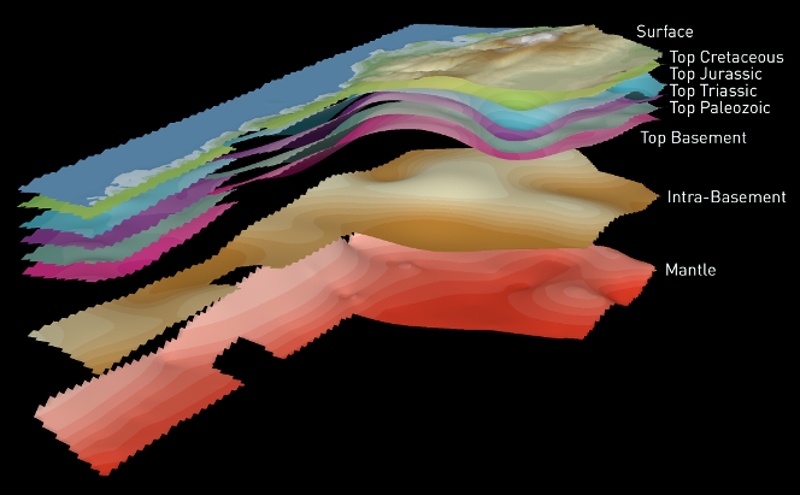 The structural layers derived from the 2D models, as well as interpreted formation tops from well data, were gridded to create starting horizons for the 3D model. 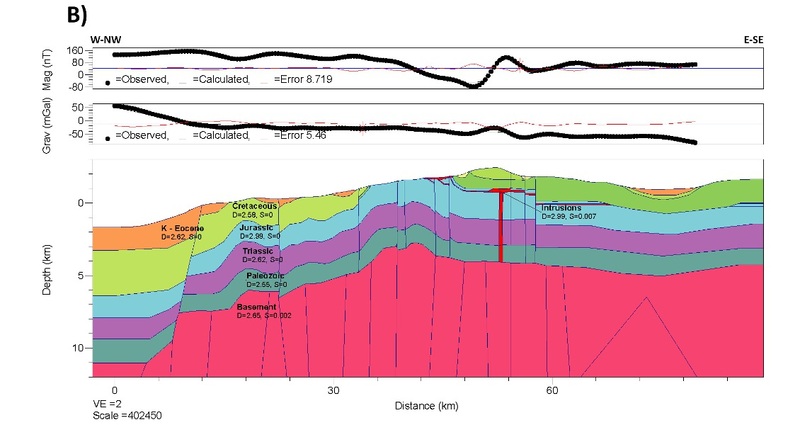 Structural model inversions over the gravity and magnetic data (Figure 5) indicate general agreement with an average basement depth at ~7,000m below the surface, with depths ranging from 4,000m to 11,000m subsea. Since the deepest well drilled penetrated just over 3,000m of sedimentary sequence above the Jurassic, the remaining 4,000m of basin have to be accommodated by additional and older sedimentary layers to reach this basement depth. Therefore, the model had to include Triassic and Palaeozoic layers, each up to 2,000m thick. This was a key finding from the project, as it affirmed the existence of several intervals that have proven to be prolific source rock and reservoir intervals in the region. Figure 5: 3D model inversion results for the entire survey area. (Source: NEOS) The Triassic and Palaeozoic petroleum systems in the Eastern Mediterranean region have been tapped in Jordan, Israel and in the Palmyride Basin in Syria. Stratigraphic correlation based on wells shows that the Jurassic and Cretaceous (probably also Triassic) sequences thicken towards the present Mediterranean coastline. This suggests that the position of Lebanon coincided with a regional depocentre within the Palmyride Basin (Nader, 2011) and that, perhaps, rocks similar to the reservoirs in Syria can also be found in Lebanon. The existence of a Triassic sequence onshore Lebanon has been a matter of debate for a long time and only a few studies have focused on its hydrocarbon potential. The lack of Triassic outcrops and well penetration forces one to rely on indirect measurements to define this sequence, but the modelling efforts of this project strongly indicate that thick Triassic (and Palaeozoic) intervals exist in the survey area (see The Triassic Margin Play, Munim Al-Rawi, for further discussion on the Triassic in the region). 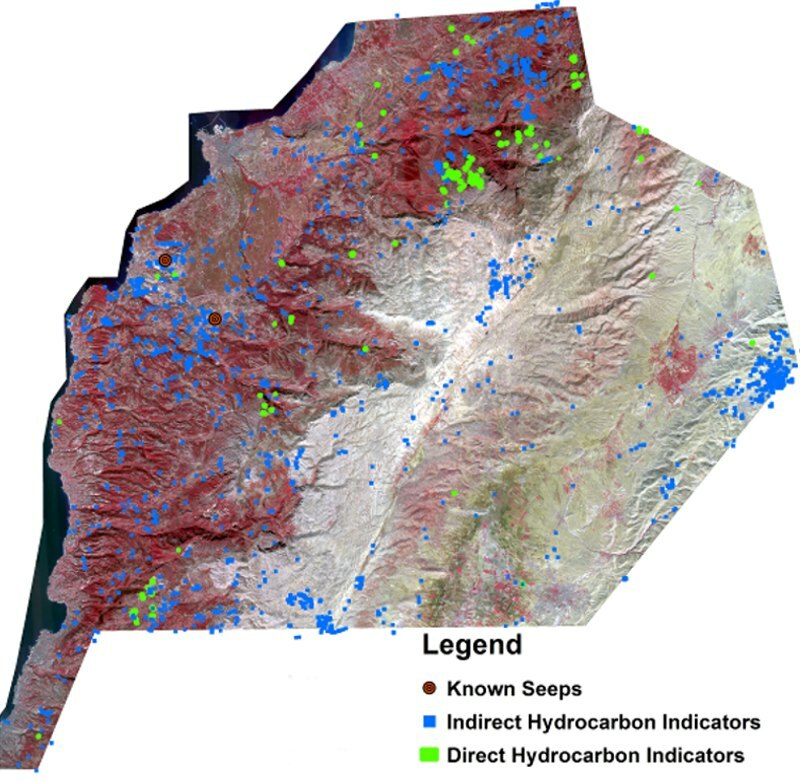 The fact that hyperspectral imaging indicates numerous and areally extensive oil seeps and indirect hydrocarbon indicators in the area further de-risks Lebanon’s exploration potential. Beginning one of many flights for the airbourne gravity, magnetic, radiometric and hyperspectral surveys. A pilots view from the surveying aircraft. Snow capped hills from the cockpit of the surveying aircraft. A thin scattering of snow caps the highlands in the surveyed area. Additional interpretive products generated during the project identified the presence of multiple source rock intervals, the existence of sedimentary depocentres, and typical structural trapping mechanisms such as anticlinal closures and prospective reservoir intervals abutting faults. 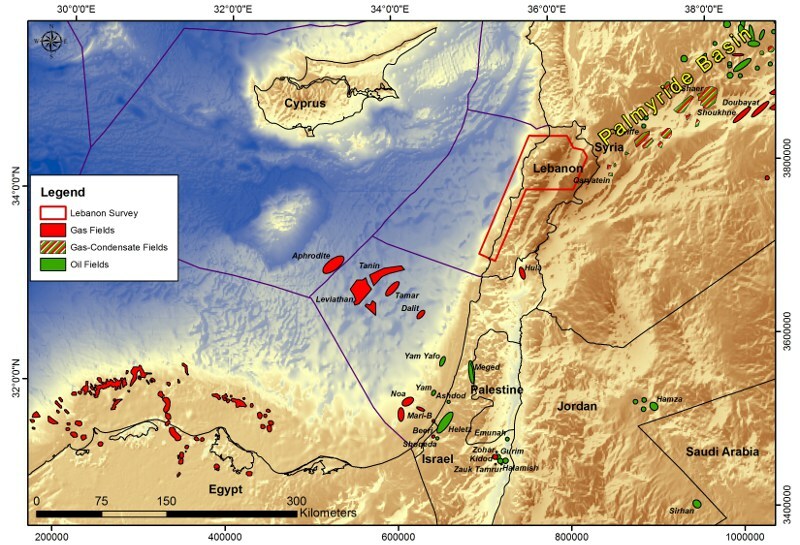 The features noted above were observed at different intervals within the geological column and in different parts of the area of investigation, including along the near-shore coastal waters of Lebanon, suggesting a variety of potential exploration play types (both gas and oil plays) might exist in the country. The onshore hydrocarbon potential is found in deeper and older sediments in the stratigraphic column with a gas and liquids upside, whereas the offshore and near-shore potential appears to be more gas prone and trapped in younger and shallower sediments. The multitude of plays and the stacked nature of several of them – all now high-graded following this project – serve to de-risk the overall exploration opportunity. Lebanese vineyard in the snow. 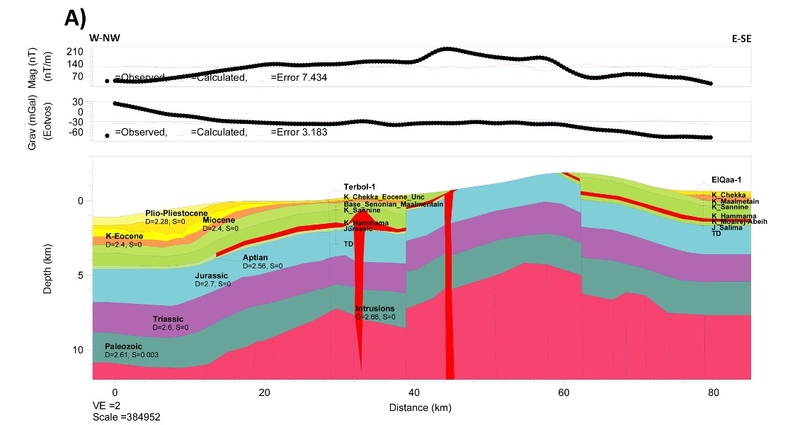 Worldwide exploration performance: how successful has 2018 been so far?